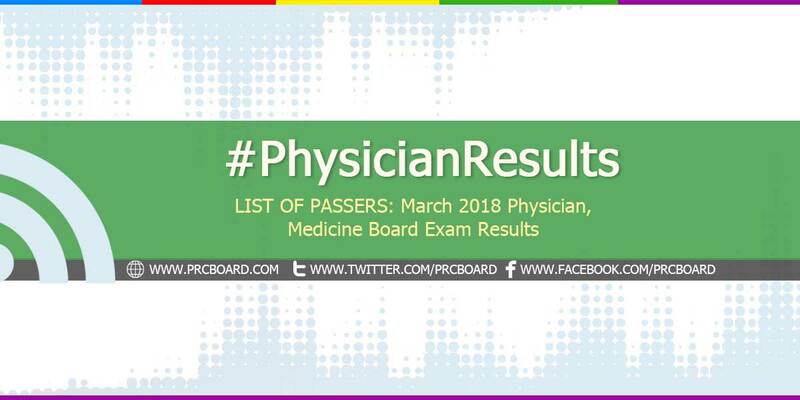 The results and list of passers of the March 2018 Physician, Medicine board exams including the top 10 examinees, top performing schools and related announcements are available at this website as the Professional Regulation Commission (PRC) officially released the results online three (3) working days after the last day of board examinations. As announced, 1,067 out of 1,601 (66.65%) successfully passed the exams. The March 2018 Physician licensure exams are administered by PRC Board of Medicine headed by its Chairman, Dr. Eleanor J. Galvez and its members, Dr. Edgardo T. Fernando, Dr. Miguel L. Noche Jr., Dr. Eleanor B. Almoro, Dr. Ma. Graciela Garayblas-Gonzaga and Dr. Clarita C. Maaño on March 4-5 & 11-12, 2018 at PRC testing centers in Manila, Baguio, Cebu and Zamboanga. The schedule of online appointment for issuance of Professional ID and Certificate of Registration will be from March 22 to April 16, 2018. As per Resolution No. 2017-1068 entitled "Schedule of Licensure Examination for Year 2018", the target release of March 2018 Physician/ Medicine board exam result will be on March 15, 2018 (Thursday) or three (3) working days after the last day of exams. However, the above-mentioned date is not final as PRC may also release the Physician/ Medicine official results earlier or later than the stipulated date without prior notice. Just keep tuning-in at at this article for timely updates. On the same exams conducted by PRC on September 2017, results were released after four (4) working days. On March 2017 and September 2016, results are out after three (3) working days while two (2) working days during March 2016. The March 2018 Physician board exam covered topics from Biochemistry; Anatomy and Histology; Microbiology and Parasitology; Physiology; Legal Medicine, Ethics and Medical Jurisprudence; Pathology; Pharmacology and Therapeutics; Surgery and Ophthalmology, Otolaryngology and Rhinology; Medicine; Obstetrics and Gynecology; Pediatrics and Nutrition and Preventive Medicine and Public Health. Physician/ Medicine is one of the programs with average number of examinees being administered by PRC. In the most recent exams conducted on September 2017, 3,340 out of 4,064 examinees passed. Vincent Edouard Anthony Retardo Gullas from University of Santo Tomas (UST) ranked first in the exams garnering 90.50% rating followed by Jan David Choa Monzon and Robert Carandang Reña, both from De La Salle University - Health Sciences Institute having 90.08%. Cebu Institute of Medicine and Saint Luke's College of Medicine shared the top spot in the top performing school having 100% overall passing rate. On March 2017 Medicine licensure exams, 813 out of 1,317 examinees passed. Far Eastern University got the top performing school spot having 157 out of 178 examinees passed or an overall passing rate of 88.20%. Karl Emmanuel Cueva Mercader from University of Perpetual Help System Dalta - Las Piñas ranked first in the top examinees having 88.58% rating followed by Alvin Lester Samson Villas from Our Lady of Fatima University - Valenzuela having 87.17%. On September 2016 Physician board exam, 2,899 out of 3,695 examinees passed. Pamantasan ng Lungsond ng Maynila and Saint Luke's College of Medicine were the top performing schools having all of its examinees passed. Jeri Charlotte Co Albano and Edwin Mark Lim Chiong from University of Santo Tomas (UST) got the first two places having 89.50% and 88.75% respective ratings. On March 2016, 483 out of 1,044 examinees successfully passed. Far Eastern University (FEU) - Nicanor Reyes Medical Foundation was the top performing school having 91 out of 113 examinees passed or an overall passing rate of 80.53%. Al Patrick Cajandab Alajas from Southwestern University - Matias H. Aznar Memorial College of Medicine ranked first garnering 88.67% rating. He was followed by Eunice Lovelle Rosaroso Clarito from Our Lady of Fatima University - Valenzuela having 87.83% and Jomari Rieza Binas from Central Philippine University having 87.25%. Meanwhile, here is the summary of Physician results in the last four (4) years. To receive up-to-date news about Physician board exam results for March 2018, we advise our visitors to bookmark this page, visit PRC official website or follow us at our social media pages via Facebook and Twitter.